We are housebound – high winds and rain have closed just about everything in Arlington, VA and the surrounding area. So of course I was eager to get out the art supplies. I have a set of these paper mache’ letters from Jo-Ann Fabrics. I hope to decorate the whole alphabet for my kids (as see on the Land of Nod blog) but that will have to wait! By the way, one could definitely cut letters like these out of cardboard. They are about 8 inches and you could draw them free hand or use the text art feature in Word to create a block letter that you trace onto the cardboard. I gave my 2-year-old the first letter of his name – “M” and let him choose his paint. 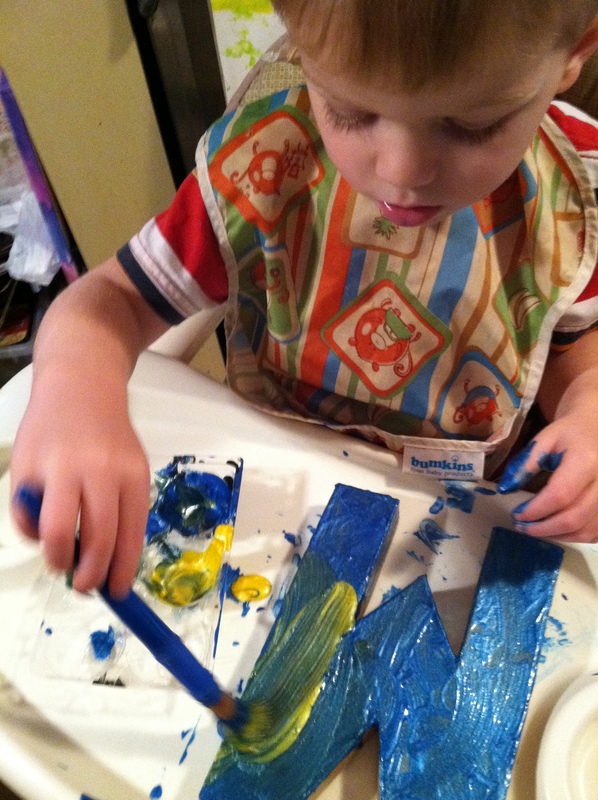 He picked blue and used a paint brush to paint the entire letter. He then wanted a second color just like his sister, who was also painting her initial. 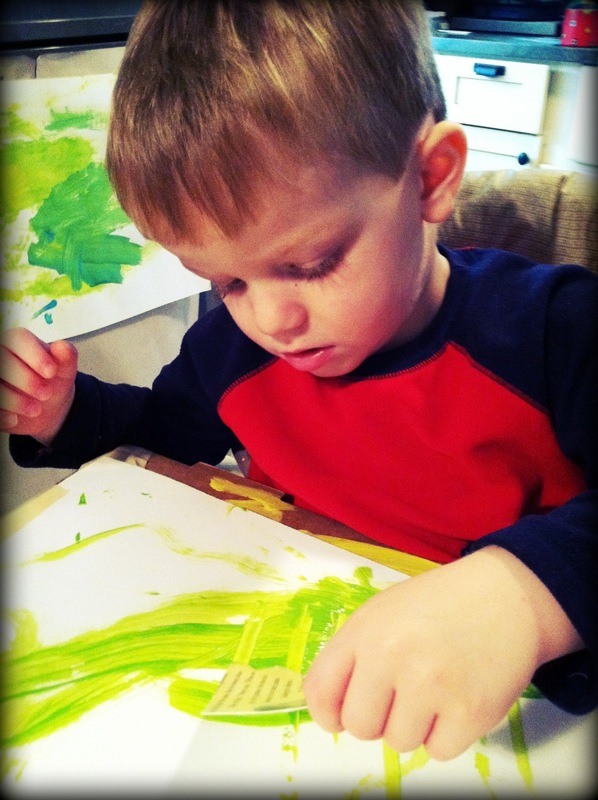 He chose yellow and began painting right on top of the wet paint. As he began to paint the yellow right on top of the wet blue paint, he declared “it’s disappearing…I made green!” It warmed my heart to know that all my efforts to support his creative process through carefully worded process comments has paid off! Whenever I offer my kids art activities, I try to be present and comment on their work in a way that helps to develop their vocabulary and also support their creative process. And by comment, I don’t mean that I say “ooh, how pretty,” which is usually not very meaningful. In the past when M has mixed a light color into a darker color (as he did on his initial), I have made comments like “Wow, I wonder where the yellow paint went?” or “Oooh, it looks like the yellow paint disappeared.” When he ended up mixing the two colors to make a new color, I would say “look, you made a new color!” or “look, you made green, I wonder how you did that.” All of these comment help to give children a vocabulary to describe their process. It makes their process more meaningful to them as it draws attention to what they are actually doing and the results that they are seeing. 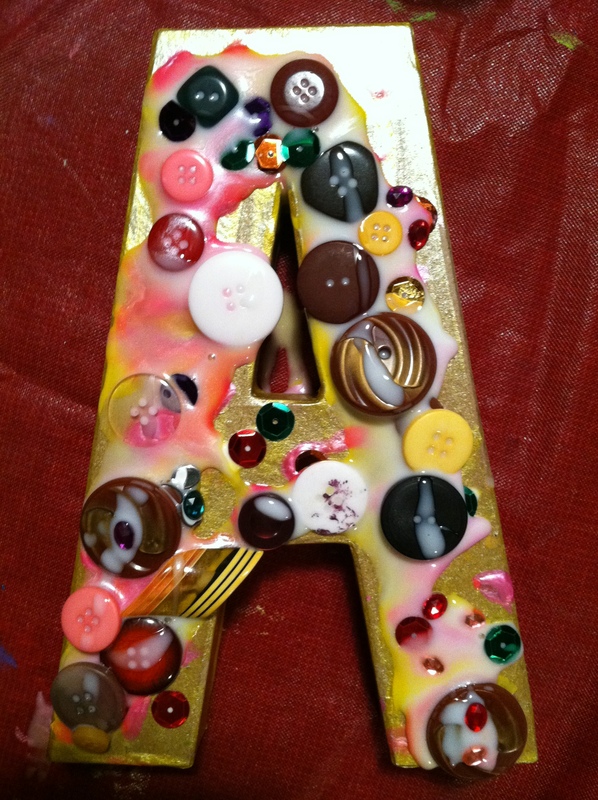 My four-year old daughter also created her initial and even embellished it with sequins, buttons and rhinestones, using lots of glue, of course! It was a messy, fun activity that helped to provide some entertainment as we were stuck inside all day and may be again tomorrow. I’d love to hear what activities you are doing when you are homebound! ArtStarts can come to your child’s birthday party and conduct a dynamic art activity in conjunction with the birthday festivities. You provide the venue and I provide the creative adventure for children! A typical activity would include a 15 minute introduction to include stories, music, and/or movement, followed by a 30 minute art activity. I believe one of the most valuable aspects of incorporating an art activity into a birthday party, is that you give the birthday party guests a fun and meaningful gift that they can take away with them. This basic package starts at $120 for up to 8 children. Additional activities can be incorporated for additional fees. Please contact me with the details for your party and I can help you plan an art party to make your child’s birthday a memorable one! I apologize, but I have had to cancel these classes, including the free open house class, due to low enrollment. ArtStarts is back this Fall with more art classes for children. This 4 class series will be held Tuesday afternoons at Lyon Park Community Center in Arlington. It is a great opportunity for children to attend with their parent or caregiver and to interact with other children in a creative setting. ArtStarts is a unique art program for children offering group and individual art classes and art birthday parties throughout Arlington and Northern Virginia. These classes provide the opportunity for exploration, discovery, self-expression, and positive social interaction. Children have the opportunity to work with a wide range of art materials such as paint, clay, markers, crayons, and paper, while also engaging in stories, songs, and movement. Examples of ArtStarts class activities include mask making and rock painting among many other exciting adventures in creativity! This Fall art class series consists of 4 classes held on November 27th and December 4th, 11th and 18th from 4:10pm to 4:50 pm. Lyon Park Community Center is located at 414 North Fillmore Street, Arlington, VA 22201. The cost for the series is $60 and all materials are included. The class fee is payable to Nicole Holohan via PayPal. If you have any questions about this class or would like to register your son or daughter, please contact me at ArtStarts.Nova@gmail.com. Due to low enrollment, I have had to cancel all classes, including the free open houses on November 13th and 14th. I apologize for the inconvenience. I am excited to kick off my ArtStarts class series with 2 free art classes for toddlers and preschoolers. Come check it out just this once or sign up for one of the 4-class series that start the November 27th or 28th. Free ArtStarts children’s art class. Toddlers and preschoolers are invited to attend this free class with a parent or caregiver. This dynamic class will incorporate story, music and movement with an age appropriate art activity. The class will be held at Lyon Park Community Center 414 North Fillmore Street Arlington, Virginia 22201. Check out http://www.ArtStartsNova.com or email Nicole at ArtStarts.Nova@gmail.com to sign up for this fun, free event. Free ArtStarts children’s art class. Toddlers and preschoolers are invited to attend this free class with a parent or caregiver. This dynamic class will incorporate story, music and movement with an age appropriate art activity. The class will be held at Lyon Village Community House 1920 N. Highland Street Arlington, VA 22201. Check out http://www.ArtStartsNova.com or email Nicole at ArtStarts.Nova@gmail.com to sign up for this fun, free event. It’s cloudy and rainy, it’s Friday, and there is no school today! So we did a fun, green, process oriented kids’ art activity. We occasionally get those paper milk cartons and I hate throwing them out since I just know there is some way to repurpose them! I decided to turn them into paint scrapers. I made about 8 scrapers out of one carton – 2 scrapers per side. After I cut out the eight rectangles, I cut small triangles out of the edges to create either pointed or flat edges or a combination of both. These are reusable to a point – if they get too wet, they will start to fall apart. 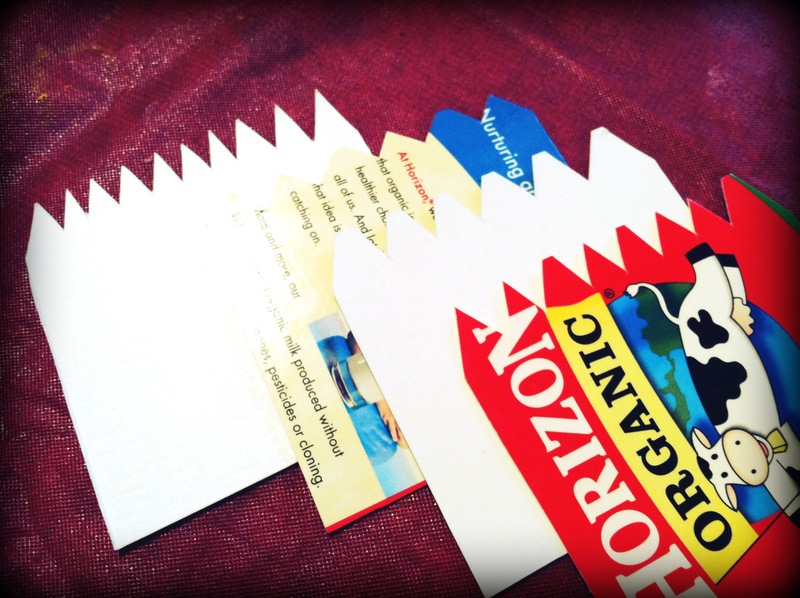 Repurposed milk carton – great for rainy day painting activities. Now my daughter was excited to paint! She loves painting and especially loves to squeeze and stir. 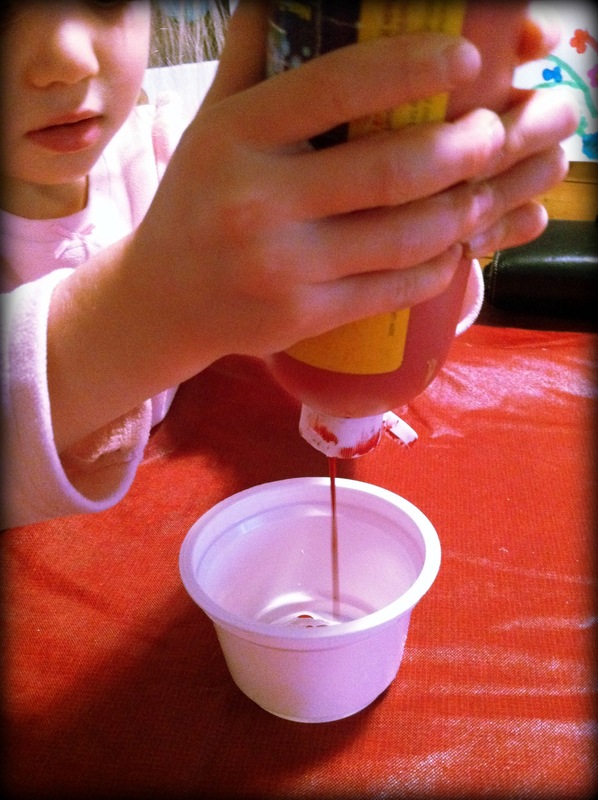 I let her pick her color, squeeze the paint into the cup and stir the colors. 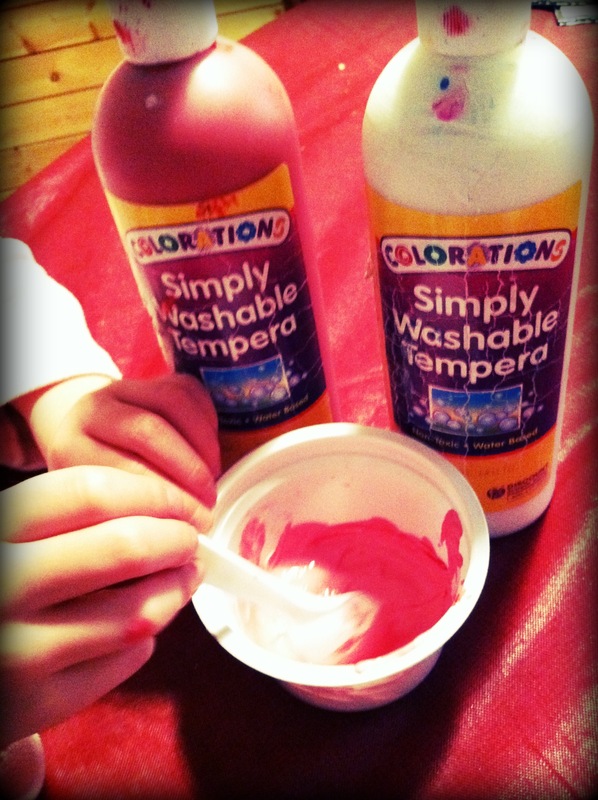 She wanted pink, so after asking her what colors she needed to make pink, I gave them to her and let her squeeze and stir. 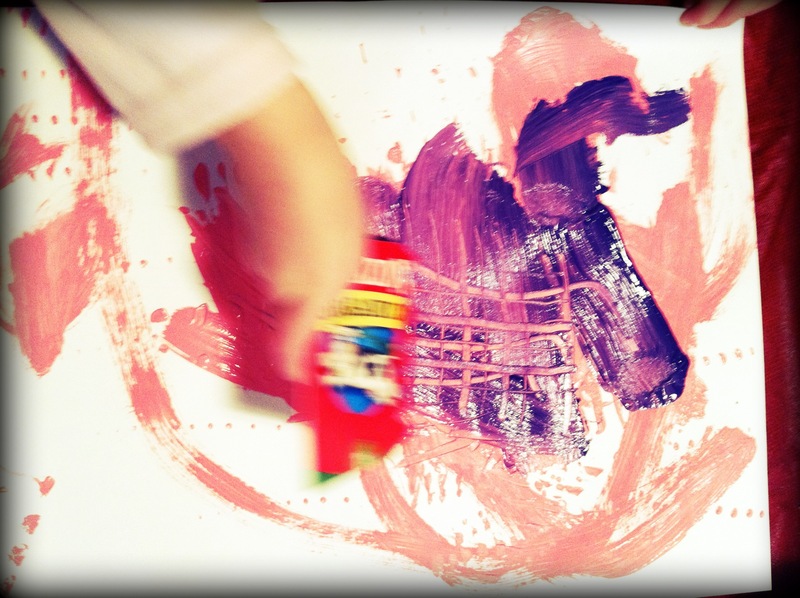 Kids love to squeeze paint – let them do this and they will be more invested in the process! Then it was time to test out our new paint scrapers. I first let my daughter put a blob of paint in the center of the white paper. Now, while I wasn’t happy with the result I was focusing on the process, so I thought I had better let the process unfold. I’m happy I did because “A” discovered all on her own that she could make several small dots just by touching the paint scraper to the white paper after having dipped it in the paint. 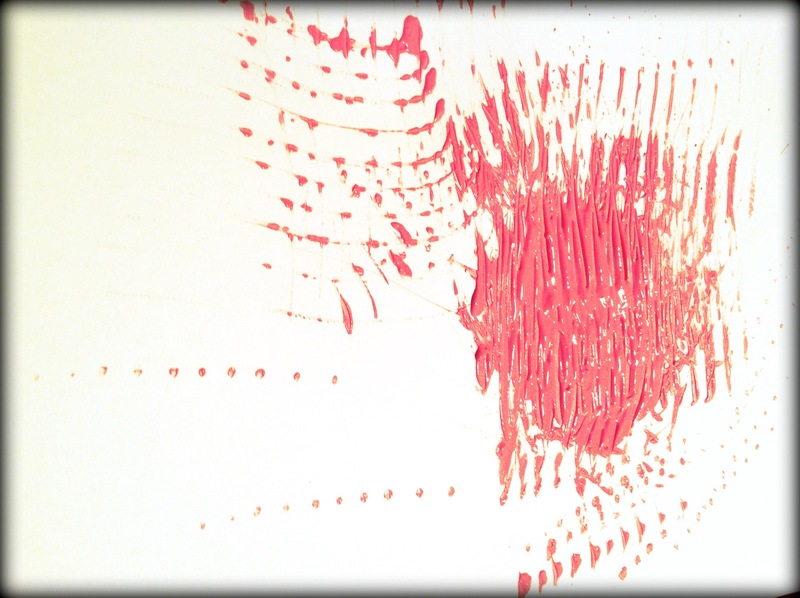 Scraping the paint through the blob of paint – not the result I had hoped for. Letting the process unfold allowed my daughter discover she could make tiny dots with the edge of the scraper. After she had explored the above techniques, I suggested she paint the page with a brush and try a different scraper. I pointed out the different scrapers and how some had lots of pointy ends and how some had flat ends. 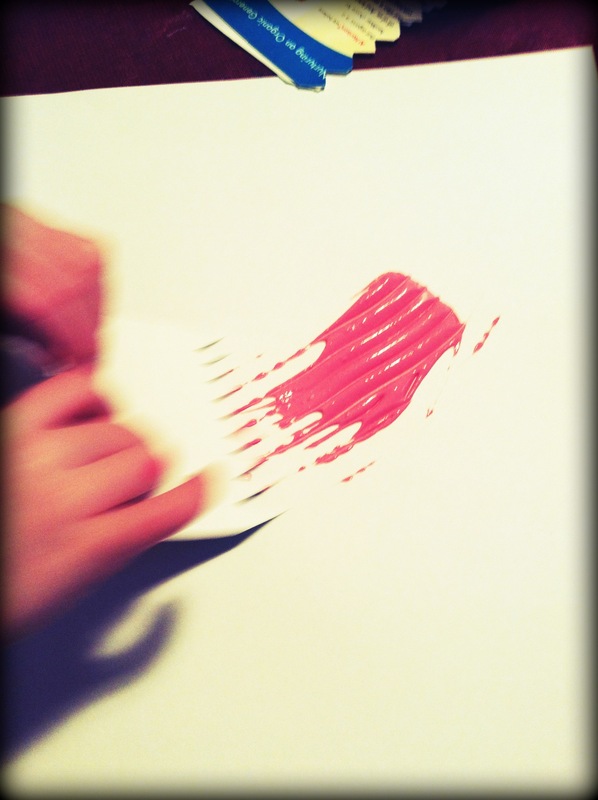 After she painted with the paintbrush, she picked a scraper and went to work. 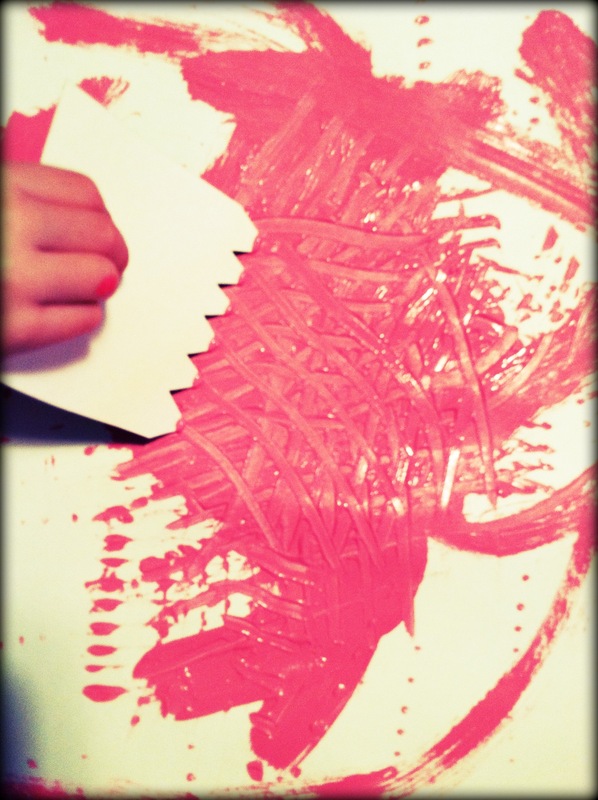 “A” chose a flat edged scraper to run through the pink paint. I wanted “A” to have more opportunities to see the scraper in action. The lines made by the scraper would be more visible if she used a darker color so she chose purple. 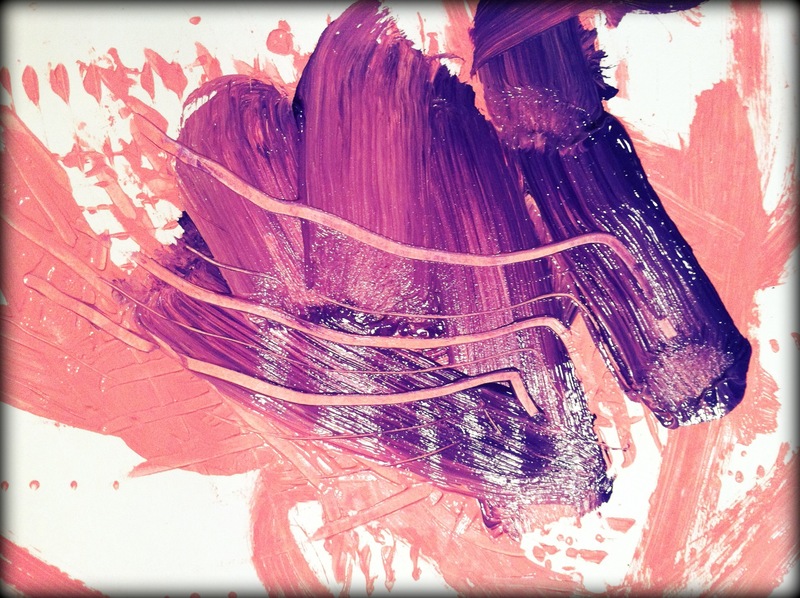 “A” chose a second color to paint on top of her pink paint. Running the scraper through a darker color helped make the lines show up better. “A” discovered she could make a “net” by running the scraper in different directions. One of my favorite things about doing art with kids is watching how they interact via the creative process. I think my son (2) has drawn, painted a sculpted way earlier than my daughter ever did, primarily because he wants to get in on the action. He got some paint, a brush and then a scraper and did his own painting. Of course he was way more interested in the images he saw on the milk carton turned paint scraper but, hey it’s all part of the process, right! Little brother “M” wants to do some paint scraping as well. Kids love monsters – especially when the child is in control. “You be the monster,” my 4 year old says to me, then runs screaming and laughing across the playground. Last year, ArtStarts October art class featured monsters – lots of them! We read Go Away Big Green Monster, by Ed Emberley. With this story, a great way to really get kids involved, is to have them stomp their feet and shout “Go Away,” when the story tells the Green Monster to go away. Then we listened If You’re a Monster and You Know It. Kids got a kick out of stomping and growling like monsters. Art making consisted of painting paper plate masks and decorating them with colorful collage materials like tissue paper, felt, and feathers. 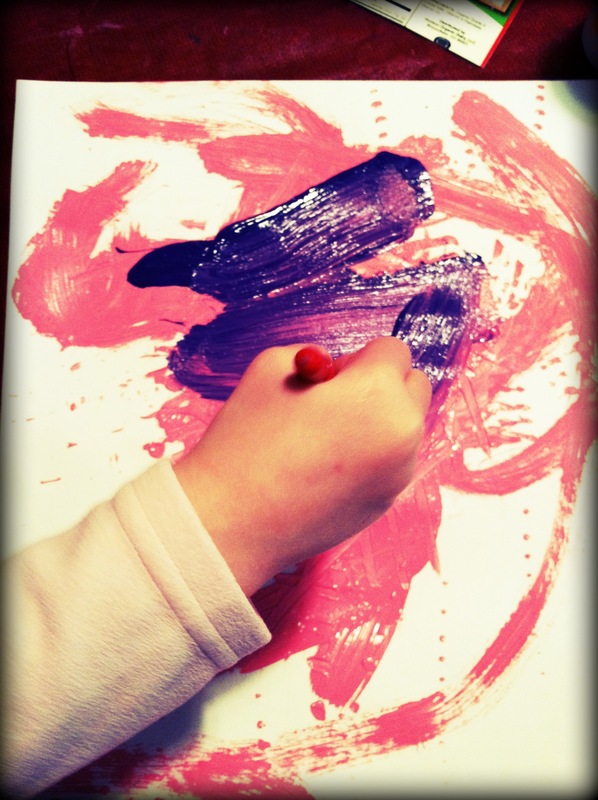 Check out some pictures from the My Little Monster art class. My apologies, but this class has been cancelled due to low enrollment. ArtStarts is back this Fall with more art classes for children. This 4 class series will be held Wednesday mornings at Lyon Village Community House in North Arlington. It is a great opportunity for children to attend with their parent or caregiver and to interact with other children in a creative setting. This Fall art class series consists of 4 classes held on November 28th and December 5th, 12th and 19th from 10:10 am to 10:50 am. Lyon Village Community House is located at 1920 N. Highland Street Arlington, VA 22201. The cost for the series is $60 and all materials are included. The class fee is payable to Nicole Holohan via PayPal.